Ashtanga Vinyasa Krama Yoga and Beyond...at home : Sharath, Paramaguru? What is the meaning, significance of the Paramaguru title. 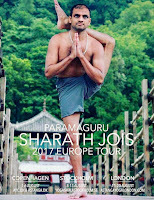 Sharath, Paramaguru? What is the meaning, significance of the Paramaguru title. Scroll down to end of post for 2017 and 2018 updates. Surely, 'Archarya', is quite sufficient. I'd actually put this post back into draft however Sharath's new title seems to be gaining traction, in blog posts Eg. 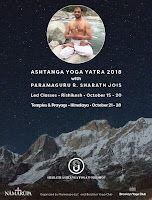 "Sharath Jois is the living paramaguru of Ashtanga yoga", the advertising and promotion mentioned in the post below as well as increasing casual reference on the internet by Certified/Authorised teachers and students alike such that it's origin seems worthy of comment. I was asked why Sharath is suddenly being referred to as Paramaguru (highest guru/guru of the parampara?) in the advertising for the current US Tour ( my reply become too long for an fb comment thus the post). At first I thought it might just be marketing on behalf of Sonima, the organisers of the tour, that was a depressing thought. 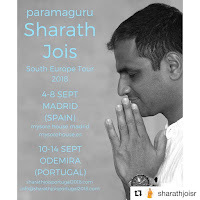 However on digging it turned out that no other than Eddie Stern referred to Sharath as Paramaguru on his Brooklyn Yoga Club site earlier this year. 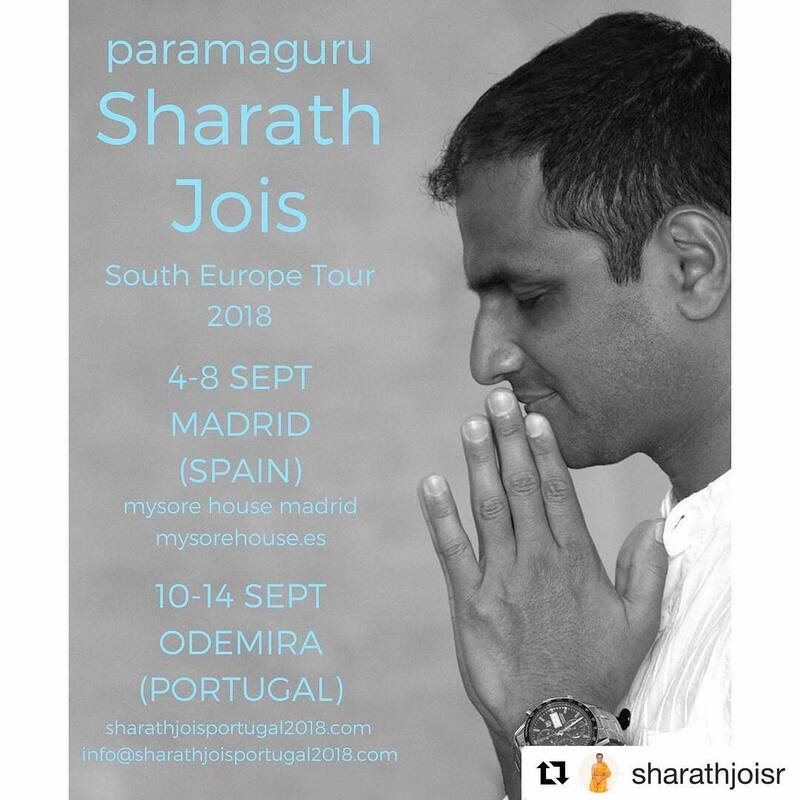 "Sharath was bestowed the title of Paramaguru, which indicates that he is the current lineage holder, or the Guru of the parampara, that has been passed down from Sri K. Pattabhi Jois". A little more digging and I found last months Namarupa with a special on it's 2015 'Yantra' (Himalayan retreat/tour). It turns out that although this was the first time Sharath visited Uttarkashi and only stayed a few days the elder Sannyasis and Sadhus decided or were asked (was there a donation involved or was bringing 150 tourists to the flood damaged area enough) see http://tinyurl.com/jrwuola) to give him an honorary title, Paramaguru (See extended quotes below from the namarupa article). 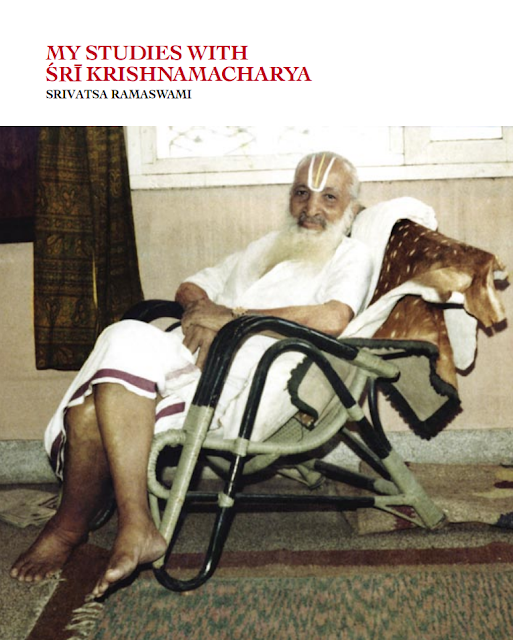 Sharath's relationship with his grandfather clearly had a powerful and influential effect on him, leading him to stress the concept of parampara in his teaching. Personally the concept doesn't interest me in the slightest, not in reference to Sharath (who I do happen to respect as a practitioner and teacher, as I do anyone who has practiced as long or significantly longer) or teachers I've spent a little time with like Manju (who jokingly calls out "Never fear guru's here" when he enters the shala at the beginning of a workshop) or Ramaswami or even Patabbhi Jois and Krishnamacharya for that matter. I find the concept of the guru and parampara, as presented, along with that of 'a lineage' or 'tradition' unnecessary, even a hinderance, and along with the growing adoration that seemingly goes with it perhaps the most off-putting aspect of recent Ashtanga. 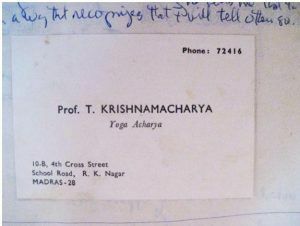 In this Krishnamacharya 'tradition' ( I actually prefer 'approach' or 'method' to tradition) it's enough perhaps to practice daily and for a long time some appropriate asana, a little pranayama but to focus more on working with Patanjali's Yoga Sutras (or another appropriate meditative practice along with ones own cultural yama and niyama ) and not worry too much about what you call it, who taught it or where it came from (I'm, very much aware of the irony here given the nature of this mostly retired blog). I'm too cynical of origin narratives perhaps, and coming from the UK, of honorary titles. Such titles appear to elevate the holder and of course all those who claim association, in this case Sharath's students and those Authorised and/or Certified by the 'Paramaguru'. Surely, playing the game and not calling yourself a guru yet (even tacitly) accepting an honorary title like Paramaguru (The Guru of a parampara or specific tradition ) and allowing it to be used extensively in promotion suggests a worrying contradiction. Apart from anything, although he would probably throw something at me if I addressed him as guru, it's surely insulting to Pattabhi's Jois' still living and actively teaching son Manju Jois who has been passing along this approach to practice (as has his sister and Sharath's mother Saraswati) for over fifty years along with several other senior teachers and early students of Pattabhi Jois). Perhaps it's best we just agree to disagree on this. Isn't it enough to respect your teacher without elevating them to such heady heights, to approach our practice with sincerity and commitment without resorting to terminology like devotion and dedication? Read a full account in the new edition of Namarupa. Below are a few quotes from the relevant section. My favourite bit is Saraswati saying "With all credit going to Pattabhi Jois", a bit like the friend or slave who would stand in the chariot holding a laurel wreath above the head of a Roman general receiving a Triumph for a great victory whispering "Respice post te. Hominem te memento", remember thou art mortal (Look after you [to the time after your death] and remember you're [only] a man), this was to protect from hubris. UPDATE: From a friend who was at Uttarkashi. I was actually in attendance at the ashram in Uttarkashi when Sharath and Saraswati were given these honorifics, along with some lovely pashmina wool shawls bought in the local market, too, to commemorate the occasion. It was after a week of experiencing Led Primary each morning with both of them. 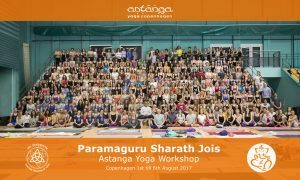 I admittedly had some trepidation about being in a big group of global Ashtanga folks as I have not been to Mysore and didn't know what to expect, but was pleasantly surprised: it was a great week, there was lots of laughter and love in the room, and a real feeling of global community, too. Sharath was funny, wise, kind, teasing, all week. Saraswati herself was gracious, kind, wise - and those who were there with me noted how Sharath was a dutiful, respectful son, attending to her needs/wishes during the week, too. But, most importantly, the people of Uttarkashi, who really suffered in 2013 because of horrific floods that devastated their town and the entire region of Uttarakhand (whereby, most of their vital pilgrim tourism trade was lost) were extremely grateful for our group of 150 people bringing a needed boost to the local economy. In fact, Namarupa was the first big group, and first Western group, mind you - to return to the region since the floods. My sense of the honorifics given to both Sharath and Saraswati was that they were a way of saying thanks and capping the week off. Sharath in particular seemed bashful about the honor. It's my belief that Eddie Stern, who was also in attendance, who honors Sharath as his teacher now, and who is responsible for the marketing of his world tour, has taken this opportunity to "run with" the title - it's my sense that it does not arise from any desire of Sharath to be referred to that way. My experience of him during that week was one of humility, kindness and simplicity. Just my take"! Saraswathi Jois: With all credit going to Pattabhi Jois. RSJ: [to students]: You have wealth, you have book knowledge. You have everything. If you don't put your mind towards adhyatama, your heart towards spirituality, towards jnana, it's no use having this life, having everything. Guru is very important. Guru is the one who teaches, who will take us towards that jnana which is the true knowledge. He removes all the obstacles in us and he removes all the pollution in us. He gives us the true knowledge, jnana. It has touched my heart deeply, all the love and affection everyone has given. Thank you so much. See you again. "This practice that we are doing is an age-old practice; it has come from parampara, from the guru -shishya parampara—from Guru to his shishyas, Guru to his students. When a student becomes a master, then he becomes a Guru and passes his knowledge on to his students. Like this, the yoga knowledge has been passed on for generations. As we know it in this form of Ashtanga Yoga, it has come from maybe 300 years ago—I don’t know for how many generations this knowledge has been passed on". 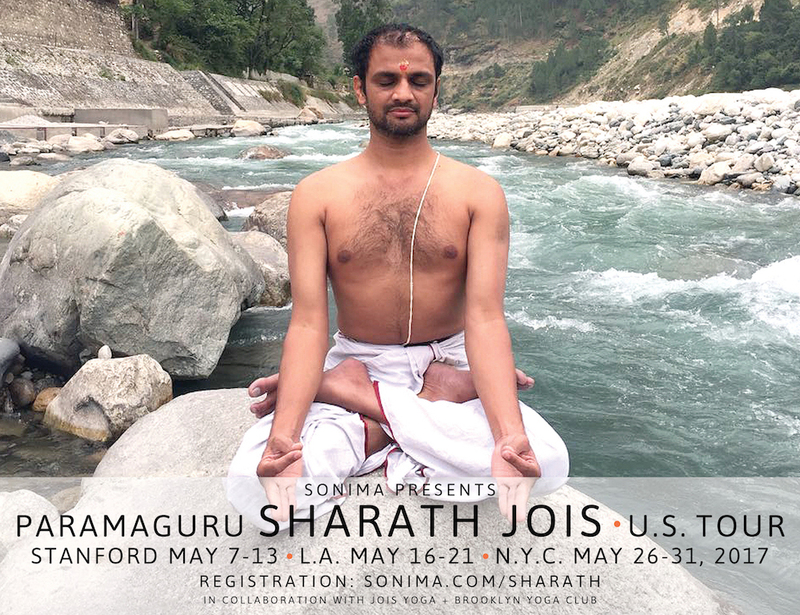 And below Sharath talking about the idea of Guru with Sonia Jones of Sonima, the organisers of Sharath's current US tour. The question of parampara came up at his years Ashtanga yoga Confluence, here's a recap from Tim Miller's blog. This past Sunday during the final panel discussion of the 2016 Ashtanga Yoga Confluence, a question was asked about the concept of Parampara and how it is interpreted in the Ashtanga tradition. David Swenson reminded all of us that Guruji’s own eldest son, Manju, was present in the room, and if anyone could be considered the true lineage holder it would be him. Everyone in the room stood up and gave Manju an ovation. It was a very moving moment. I looked over at Dena and saw her eyes welling up with tears just like mine. 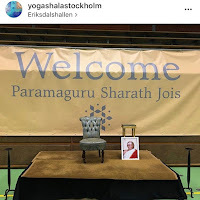 Manju was very gracious and said that as far as he was concerned, all of us sharing the stage with him and countless other teachers throughout the world are all part of the Parampara. 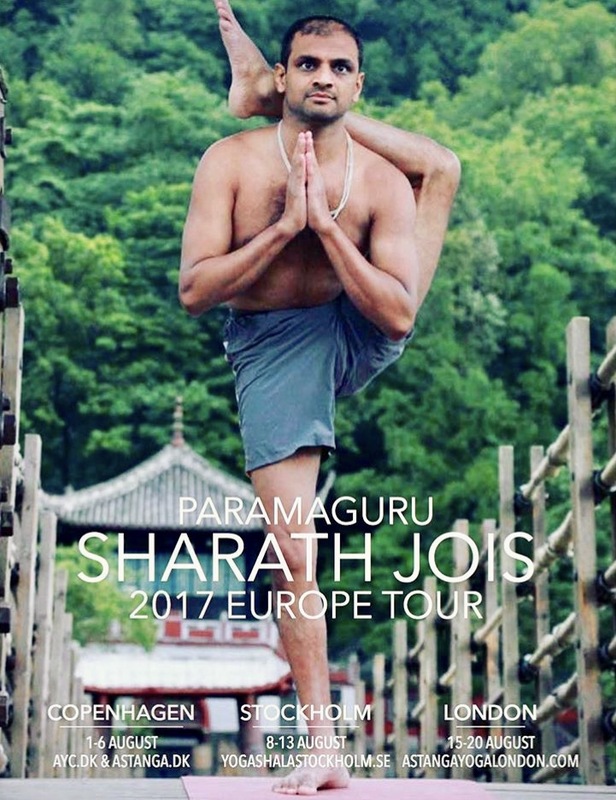 New video uploaded today on Sharath's Youtube channel, sharath jois rangaswamy, titled Paramaguru, Sharath Jois Yoga Class in New York. "All I can say is I just spent the last 6 days in one of his two daily guided primary series - he did 2 per day in Palo Alto, LA, NYC and Miami and he was super helpful, walking around adjusting over 200+ sweaty practitioner, making jokes and just generally being a super nice guy. So say what you will, but in my mind he knows the practice as well or better than any other living being, is an extremely hard working and dedicated guy, and a genuine nice guy. Not sure what else one can ask for. As he said to us after our practice today - "Keep Practicing!". I was prepared to give Sharath the benefit of the doubt on this last year but here it is again, the 'Paramaguru' title rolled out once again again for this years round of advertising. I find it a source of concern that Sharath encourages or perhapds more accurately, allows this 'title' to be used in his promotion. Surely a quiet word with Eddie Stern, with Sonia Jones of Sonima, asking them not to use the 'parampaguru' would suffice. Sharath doesn't teach that many workshops, asking those who invite him not to use a title in their advertising would stop the trend. One of my concerns with the Paramaguru title is that that it reenforces still more perhaps the power structures that allow can abuse to take place and remain hidden (Think for example the interviews in the GURJI book). The Ashtanga world was rocked at the end of 2017 by confirmation of the long whispered reports of Sharath's grandfather, Pattabhi Jois', sexual abuse (unwanted sexual touching and fondling) of students during adjustments, often when the students were bound tightly into a posture and less able to resist the touching. 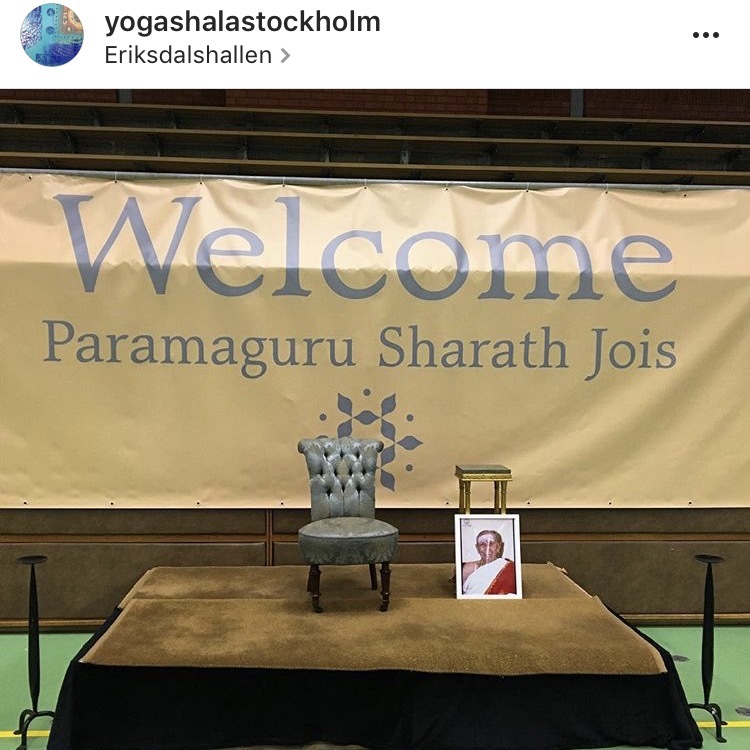 I hear this week that Sharath has addressed the issue in conference at least in Mysore, indicating that his Grandfather, Pattabhi Jois, acted wrongly and that there was an obligation to speak out. As yet there are no more details or an official statement on for example the KPJAYI website. 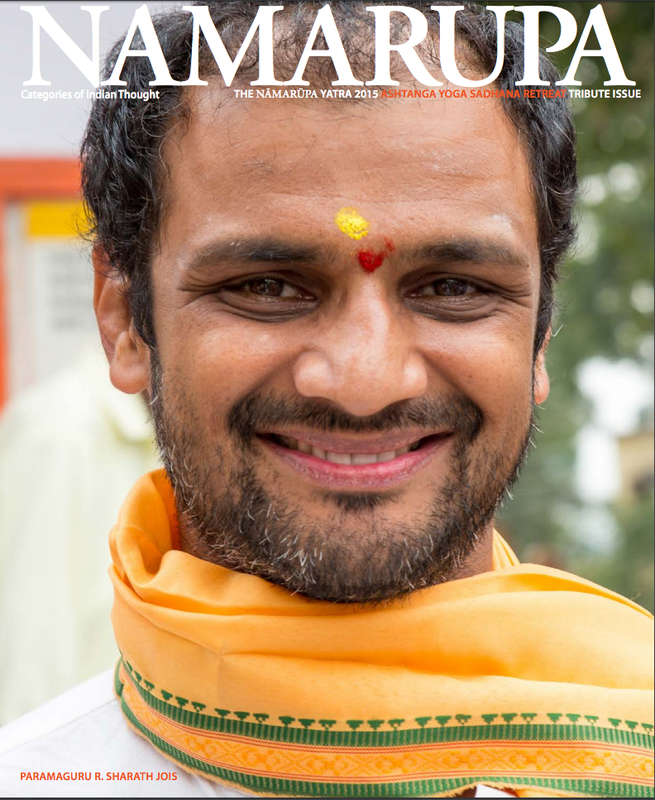 Note: Namarupa is a beautifully produced magazine and worth getting, this edition follows the 2015 Ynamarupa Yatra (tour/pilgrimage). The Sharath section mostly consists of an intro, two or three conferences which are basically the same as those that have come out of Mysore over the last few years (although here the three conferences follow on from eachother) and a couple of extra paragraphs to the above section on Parampara plus a few glossy photos of Sharath as well as a couple from inside KPJAYI. See also this article, also from Namarupa, by Ramaswami on his relationship with his teacher, It's a free download. We might ask ourselves if we have a similar relationship with our teacher or our practice. I completely agree with you Anthony. Respect of lineage, where is it? What about Manju and Saraswati? I have been studying with Manju for a while now and what I found t most fascinating about him is how humble he is. Manju always joke about the word Guru. He doesn't see himself as THE GURU. He is our teacher. In August, I was in Stockholm studying with him again. He was there at the same time as Sharath was giving his week workshop. I am not here to compare or judge but just to observe. Sharath was teaching from his stage. He had more or less 300 students. Manju was with his students (42) everyday, teaching, laughing, loving. He even cooked for all of us. Being around Manju is like going to see your father that you truly respect not only for his knowledge but for the love he gives you, for the fact that he doesn't see himself as better but with more knowledge and wisdom to share with you. Every time, I see Manju, it is like going home. He gives me knowledge, straight and most of all love. We all feel it. I went to Sharath's workshops in the past. I truly respect him but something is missing. With Manju you get what Pathabhi Jois was giving. He sees himself as the channel here to transmit his father knowledge, nothing else. Manju is even more then a Guru, he is knowledge and love. That's my humble opinion.